Steel Command - Tabletop Tactics for Armada and Beyond! : Boba Fett? Boba Fett?! Where?!?! I think a few of us figured that Boba Fett might be the counterpoint to Han Solo, though how he would fit in to the game mechanics, not really being a "Commander" seemed to suggest it would be someone else. First, Boba is an Operative, which is a completely new unit type that you'll be able to include 0-2 in your army building per the Boba Fett announcement article. Looks like a mini Commander, probably not sharing his courage, and only able to order himself. This makes the Command Cards included with him very interesting - with a 1 and 2 Pip card revealed, can we assume a 3 Pip card that only gives orders to him, or will he come with another 1 or 2? Probably the coolest thing to me about Operative though is that it means we can see all sorts of "Heros" and "Villains" show up that aren't exactly command material. I'm looking at you, entire cast of Rebels - Ruhk, the Inquisitors, Zeb, Chopper, Sabine, all have a place in the game now. Not just Hera/Kannan/Ezra. Chewbacca is another good example of someone missing from being at Han's side, and while he certainly wouldn't make sense to have as a commander, this gives design room to put him in. Maybe Lando as well, though he would make more sense as a Commander. 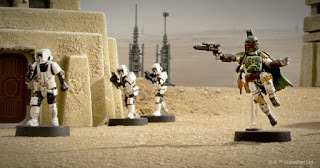 This also gives the Imperials the first chance to run 3 Command Card units in the same list, which unlike the Rebels keeps them with access to the ENTIRE Command Card library on a single list. That's... a lot to consider, though to get it you'd need to use over half your total points on Commanders and Operatives. This doesn't leave a lot for Corps units. 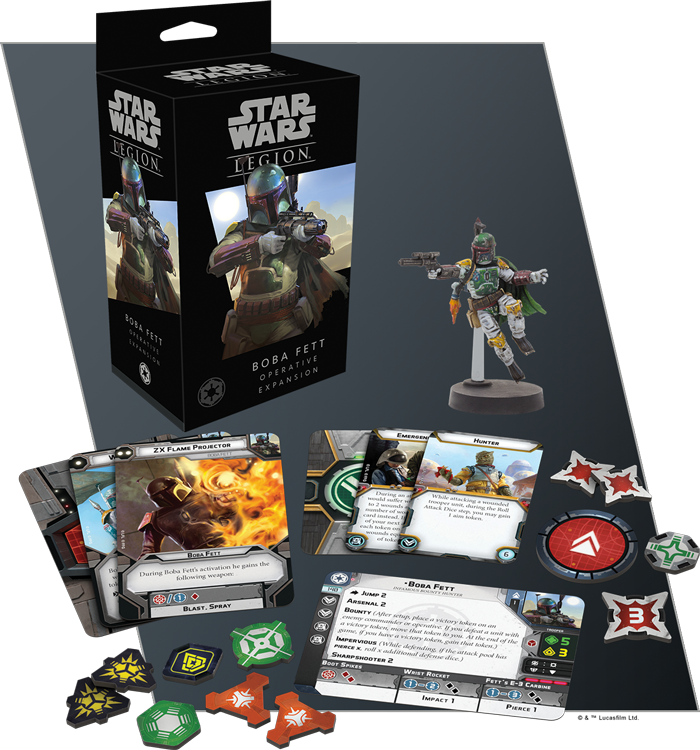 Hunter looks like a really nice card for pretty much all the commando units - Han may have that as his face down card, but it would be really unfortunate to have to buy multiple Boba Fett models to equip all your Rebel Commandos / Scout Troopers. Getting a free Aim for shooting something already injured is a pretty cool trick and helps a lot with action economy. Boba's 2 Pip Card looks like it's a new surprise source of Blast / Spray on Red dice, which combined with Boba's Speed 3 / Jump 2 will let him wreck trooper squads with a surprising threat range. ...but he has Sharpshooter 2, does he really need Blast? Speaking of Jump 2, Boba could be the king of smash and grab. Give him Environmental Gear, properly motive him with Vader, and triple move over more or less any terrain you want to, at Speed 3. Emergen(cy Something?) as an equipment upgrade is equally interesting. Looks like it might function as extra health? Something about suffering wounds, and number of (wounds) on that card instead? Luke could take something like that and be even more scary hard to kill than he already is. I really like the "Bounty" keyword on Boba Fett. Being able to add an extra victory condition to the match of hunting down an enemy Commander is a pretty cool trick! The question is does the Bounty only give a victory token to Fett if he claims the bounty, or does it give that victory token to your opponent if their unit is still standing with the Victory token? Either way, adding additional Victory Tokens up for grabs completely changes tactical considerations for the game, and should really make pre-game selection of objectives important. Boba will probably want a low Victory Token game, while his opponent will want to maximize the potential number of tokens handed out. Scout Troopers meanwhile look like a close range powerhouse, but unless you're taking their sniper rifle (and paying however many points that is) they're going to suffer trying to get into that range. Also, unusual for Imperials, no offensive surges. They're going to be interesting to play with. Not much else to talk about them aside from that, they look much like the Imperial variant of the Rebel Commandos announcement. Lots of cool things to see in that announcement. Looks like fun times for Legion ahead! I for one am super excited about the potential that Operatives bring to the game. Rogue One and Rebels themed forces will be much more likely.